School communities have powerful potential to be catalysts for good. They are places where parents’ and teachers’ aspirations and hopes for our children’s future can be nurtured and kindled into lives which are fulfilled and purposeful. Character values are vital to this process. HighLight provides a varied selection of resources to support these aims, including our ‘keys’ for headteachers, senior leaders, teachers and youth leaders. Additionally, for those organising in-service training, we will be happy to work with you to put together the ideal programme for your audience. At first glance, many of these areas may seem already embedded in best practice within the pastoral and wider curriculum. However, there are crucial aspects within these keys that may be lost. HighLight wants to work with school leaders, parents, teachers and youth leaders to promote or ‘highlight’ these truths. 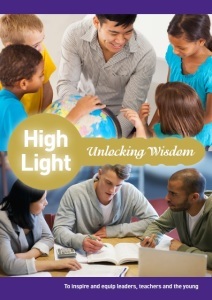 This set of papers helps teachers and educational leaders to ‘Unlock Wisdom’ in the areas of character, competence, and curriculum. HighLight believes that education in schools should involve academic and intellectual development toward the acquisition, not only of knowledge and understanding, but of wisdom: how to live. Wisdom is more than just experience; it is gained when the events of life are combined with a range of knowledge and understanding which brings insight beyond a person’s limitations. Wisdom is available when relevant values and truths are applied to shape decision-making for present and future life choices, including work and leisure. Wisdom is not just a key – it is, we believe, the true aim of education. Ten top tips from a seasoned educational professional. A Stimulating Learning Environment; Assessment; Behaviour Management; Educating the Whole Person; Honest Motives; Leadership, Vision and Ethos; Mentoring Teachers; Parents, Guardians and Carers; Social Justice And The Bigger Picture; Stewardship; Teaching and Learning; Technology in the classroom; Unconditional Acceptance; Uniqueness of the Individual; Worldview; Youth Worker as Role Model. Accessing the Keys: Four sample Keys are available for free and the Ten Top Tips paper (above). The others are available to Friends of HighLight. Five new or updated Keys are sent to Friends of HighLight each year. Education needs to inculcate an attitude of responsible stewardship with regard to resources, finance and responsibilities on a personal level and with regard to responsibility as an employee and to citizenship in the wider community. Effective teaching, we believe, is based on a relationship of unconditional acceptance of pupils by the teacher. This relationship involves encouragement and affirmation. The values of forgiveness and grace are vital in any inclusion agenda. The wise teacher aims to chart a course between naïve optimism and fear about technology and the possibilities and potential of technology in the classroom. This key explores this approach recognising the value of technology for learning but also the challenges it brings. Guidance is provided for the teacher and head about how to innovate in the use of technology whilst still valuing the ‘tried and tested’. A set of resources is provided for further reading. The importance of this key is well documented. Students are always positively or adversely affected by the model their leader presents. Students should expect the example of the teacher/youth worker to be one of maturity, integrity and dedication to their welfare. The physical environment that surrounds learning should be bright, attractive and of high quality. Attractive displays with commendable examples of students’ work will inspire and motivate others to better efforts. The careful and thoughtful choice of aesthetically pleasing resources, artefacts and books should promote a healthy desire for learning. Professional guidance can ensure the best solutions when designing or facilitating the ideal learning environment, both inside and out, providing suitable facilities. In any assessment the person is more important than the performance. Assessment is a vital component of all teaching and learning. It should be used creatively in identifying current achievement and the planning of future objections. Testing and results should be used sensitively. Assessment is a reality check but it needs to encourage and promote a positive attitude. It is not enough merely to ‘manage behaviour’; hence we suggest that the term ‘behaviour management’ is deficient. There is a need for agreement and training in what is acceptable as right and wrong, and what is appropriate, with regard to personal behaviour and relationships. True mentoring involves correction and sometimes consequences through loss of privilege. All such ‘discipline’ must be just and equitable with the aim of the restoration of the student once misdemeanours are dealt with. There needs to be a distinction between forgiveness and consequence. Unconditional acceptance of the student is the basis for all correction. Education is much more than academic and practical knowledge; it involves the heart and spirit of the learner. The school’s curriculum must address physical, social, emotional, moral, cultural and spiritual development in addition to intellectual and academic development. Providing knowledge and attainment without also developing character and an ability to form and nurture relationship is counterproductive. In our ‘knowledge- economy’ intellectual skills and abilities enable people to become influential and powerful. It is important that responsibility is promoted alongside this authority to ensure the widest possible benefit. Character development, therefore, must be part of a school’s responsibility. Education, in its broadest sense, involves life-long learning. In terms of youth it embraces the experience of youth work and many out-of-school activities in the wider community which, in conjunction with schools, prepare pupils for participation in adult life. On entering a school, the atmosphere that is experienced is created by the ethos. This ethos is brought about by an agreement around a set of values and behaviours. A capable leader (whether headteacher, youth leader or any other leader) promotes these values by setting out and living out a clear vision and imparting it to the school community. Guiding principles determine structure, order, family atmosphere and positive values. These are all key ingredients. A vision and mission statement which identifies overall perspective, objective(s) and values to be promoted is essential. To achieve these requires a cohesive commitment from all leaders within the school. Both strategy and relational strengths are needed for effective progress to be measured. The mentoring and coaching of the next and future generations towards an understanding of their identity and the best fulfilment of their lives should be promoted as a way of achieving the foundational keys. Mentoring is a relational process by one who has greater maturity and experience and can aid the development of the mentored. The person mentored must freely choose to relate to, receive and learn from, the mentor for the purpose of maturity. This Key is focusing on the mentoring of staff. Recognition is needed that parents/guardians/carers legally have responsibility for the education of their children and are partners with schools in this process. Education outside of the home, whether in or out of school, should serve them and enable them in their role. The ideal aim is to provide greater consistency in the values of home and school. The so-called ‘golden rule’: ‘treat others the way you would like to be treated’, remains a universally desirable principle which promotes social justice. This leads to an examination of relational approaches such as service (and stewardship). There is a need for a serving attitude which is aware of others and their needs. This leads on, in greater maturity, to the individual’s role in serving their community, with integrity, in order to make a positive difference and promote social justice. Effective teaching, we believe, is based on a relationship of unconditional acceptance of pupils by the teacher. This relationship involves encouragement and affirmation. There is an international golden rule ‘Treat others the way you would like to be treated.’ This is important in any inclusion agenda. The school ethos should reflect a ‘family’ rather than an institutional approach. Such an atmosphere is set by the leader (whether headteacher, youth leader or any other leader). A key component of the atmosphere to be set is the acceptance of individuals as persons in their own right and the value of their uniqueness and contribution. In such an atmosphere students will flourish. The promotion by the leader of shared objective(s) or purpose and his/her motivation of different members to work as team will create a sense of ‘family’. A vision and mission statement, which identifies overall perspective, objective(s) and values to be promoted, is essential. ‘A worldview is a set of presuppositions (assumptions which may be true, partially true or entirely false) which we hold (consciously or subconsciously, consistently or inconsistently) about the basic make-up of our world’ (The World Next Door, James Sire p17). Increasingly, one of these assumptions is that everyone has the same world-view. Educational philosophy has also tried to develop thinking that remains common to every world view. We need to help our pupils to a greater understanding of our differences and have greater respect for one another. Understanding worldview, enabling students to determine their own distinctive world view and promoting tolerance of all worldviews is a key to community cohesion.